This was the first year that the Academy Awards ceremony were televised (on March 19, 1953), on black and white NBC-TV, with Bob Hope as host (in Hollywood at the RKO Pantages Theater) and Conrad Nagel (in New York at the NBC International Theatre). It was the first ceremony to be held simultaneously in two locations. It resulted in the largest audience in commercial television history. Hollywood had to admit and succumb to the competing pressures from the burgeoning home entertainment medium. The show was telecast throughout the US and Canada. The Best Picture Award was another surprise and is forever considered one of the Academy's worst choices for the top prize. 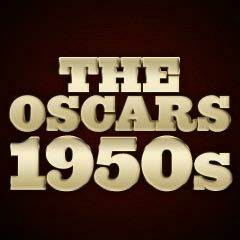 1952 has been considered one of the years in which the Academy blundered the greatest in its choice of Best Picture. The bloated, lumbering, melodramatic epic The Greatest Show on Earth was one of the Academy's biggest gaffes. This year also marked the first time in Oscar's history that all of the top six prizes (Best Picture, Director, Actor, Actress, Supporting Actor, and Supporting Actress) went to six different films. This would occur again in 1956, and then 49 years later in 2005. Instead of going to the favored, critically-acclaimed, definitive and popular western High Noon, the top Oscar - in a major upset - went to the "P.T. Barnum of Hollywood," legendary director/producer Cecil B. De Mille's gaudy epic spectacular about the struggling Ringling Brothers-Barnum and Bailey Circus, The Greatest Show on Earth (with five nominations and two wins - Best Picture and Best Writing: Original Story). De Mille's cornball film chronicled the financial and personal problems (a romantic triangle) of the tough, three-ring circus manager (Charlton Heston in one of his earliest films), a beautiful, high-bar aerialist (Betty Hutton), a crippled trapeze artist/performer (Cornel Wilde), a clown (James Stewart), and others. This ponderous Best Picture is best known not for its acting (even though it was nominated and won for Best Original Story!) but for its spectacular train-wreck sequence. The award, more than honoring the film, also saluted the film's producer, DeMille "the father (or founder) of Hollywood," with his only Best Picture Oscar - and his sole Best Director nomination. [Apologetically, in recognition of his outstanding years of producing and directing, De Mille received the Irving G. Thalberg Memorial Award instead.] He was known for making the first feature-length movie in Hollywood, The Squaw Man (1914), and many other larger than life, 'cast of thousands' films in his past (including The Ten Commandments (1923), The Sign of the Cross (1932), Cleopatra (1934), Samson and Delilah (1949), and a second version of The Ten Commandments (1956), his last film). 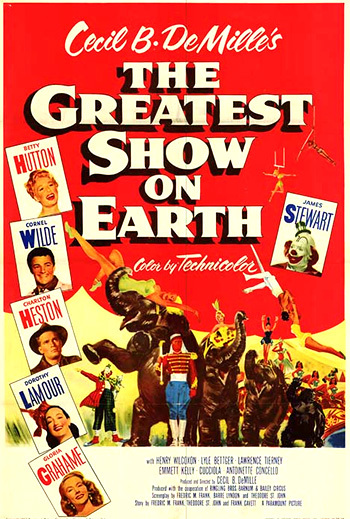 His The Greatest Show on Earth was one of the first Best Pictures that was a big-budget blockbuster with lots of special effects. The Academy felt obligated, presumably, to honor the great director as his career was coming to an end. Although it was defeated for the Best Picture award (with Stanley Kramer as producer), UA's High Noon managed to bring an Oscar statuette to mythic, small-town, retired Marshal Will Kane, played by fifty-one year-old Gary Cooper (it was his fifth and last career nomination - and his second Oscar win). The Best Actress Award winner was Shirley Booth in her film debut (with her sole career nomination - and her only Oscar for a role she had played on Broadway) as the sloppy, waddling, worn-out, drab housewife Lola Delaney (of former alcoholic, middle-aged, frustrated, and weak-resolved husband Burt Lancaster) who mourns her lost dog Sheba in director Daniel Mann's film of marital tension from William Inge's Come Back, Little Sheba (with three nominations and one win - Best Actress). [Booth's win marked the first time that an actress had ever won a Best Actress award in her first film.] It was the peak of Booth's acting career - she would appear in only four more lesser feature films, achieving more popularity in the title role on the TV comedy show Hazel in the early 60s. Susan Hayward (with her fourth of five career nominations) as Jane Froman (the real-life Froman provided the actual singing in the film) in director Walter Lang's With a Song in My Heart (with five nominations and one win - Best Musical Score) about a crippled WWII troop singer/entertainer who survived an airplane-crash during a USO tour; songs included "Get Happy"
Mexican-born Anthony Quinn (with his first of four career nominations - and first of two Best Supporting Oscars) won the Best Supporting Actor Award for his performance as Eufemio Zapata, Mexican revolutionary Zapata's (Marlon Brando) dissolute, betraying brother in Viva Zapata!. Jean Hagen (with her sole career nomination) as blonde, squeaky-voiced, silent-turned-'talkie' film star Lina Lamont in the great film musical Singin' In The Rain - a stellar performance that should have won the Oscar! This year's recipients of Honorary and Other Special Awards included producer/director Merian C. Cooper ("for his many innovations and contributions to the art of motion pictures"), noted for King Kong (1933), and silent era comedian Harold Lloyd ("master comedian and good citizen"), best known for Safety Last (1923) and The Freshman (1925). Also lacking were nominations in all (or nearly all) categories for Fritz Lang's third western Rancho Notorious, with Marlene Dietrich, and for George Cukor's romantic comedy Pat and Mike (with only one nomination for Best Original Screenplay for Ruth Gordon and Garson Kanin) with Katharine Hepburn and Spencer Tracy. Lovely, young 23 year-old blonde actress Grace Kelly in her second screen role was not nominated for playing the pacifist Quaker wife of Best Actor-winning Gary Cooper in High Noon. And Jennifer Jones was unrecognized as a white-trash Carolina swamp girl in King Vidor's un-nominated film Ruby Gentry. Cary Grant and Ginger Rogers did not receive acting nominations for their roles as husband and wife in Howard Hawks' un-nominated screwball comedy Monkey Business. And the previous year's Best Actress Oscar winner Judy Holliday was denied a nomination for her role as Florence Keefer in George Cukor's comedy-drama about a troubled marriage, The Marrying Kind (with no nominations), which reunited her with the director and scriptwriters Gordon and Kanin (who had both contributed to her 1950 Oscar win in Born Yesterday). Charles Chaplin was un-nominated as Best Actor in his last important film Limelight (1952), although he was co-awarded the film's sole Oscar nomination and win - for Best Original Dramatic Score 20 years into the future in 1972, when the film finally became eligible for Oscar consideration. It was Chaplin's ONLY competitive Academy Award win.